On the wall of a local lawyers office hangs a framed handwritten letter to another attorney. It is dated Nov. 12, 1776, only four months after the signing of the Declaration of Independence. Addressed to Daniel Hitchcock, a 36-year-old attorney from Rhode Island, the letter opens: Congress being sensible of the Necessity that immediate Steps should be taken for recruiting the New Army, have authorized me to nominate Officers for those Regiments whose States have not sent Commissioners for that purpose. At the bottom, is the distinctive signature of General George Washington. Written in the early days of the American Revolution, when the outcome of the former colonies struggle was very much in doubt, the letter from Washington implores Hitchcock to assist in the raising of a standing army. I trust that your best exertions will be employed on this occasion & those of the other Officers, to raise the Regiments, writes Washington. you must feel the necessity of the measure. Col. Hitchcock did feel the necessity of the measure, helping to raise the 11th Continental Regiment and leading it in the Battle of Princeton on Jan. 3, 1777. A week after the American victory and just two months after Washingtons letter was written, Hitchcock died from injuries and exposure. The letter is among attorney E. Powell Millers most prized possessions. And that is saying a lot. 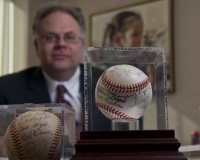 The Rochester lawyer has an extensive and diverse collection of sport and historical memorabilia. A specially designed, wall-to-ceiling display case in his office houses game bats belonging to Shoeless Joe Jackson, Ty Cobb, and Babe Ruth; an electric guitar autographed by the group Fleetwood Mac; a basketball signed by Michael Jordan when he was playing for North Carolina; a copy of the first issue of Sports Illustrated; a football helmet signed by the first 40 Super Bowl MVPs; a dozen or more autographed baseballs, including one signed by Don Larson that was used in his perfect game in the 1956 World Series. On the back of his door hangs a Chicago Cubs jersey signed by Ernie Mr. Cub Banks. On his desk are two Tiger bobble heads: pitcher Mickey Lolich and first baseman Dave Bergman. On the opposite wall are beautiful black-and-white photographs of his wife Lynn and their three daughters, Hannah, 13, and 10-year-old twins Liah and Katie. At first glance, Millers office and his collections appear eclectic and haphazard. But there is a thematic strain. To me, its all inspiring, says Miller. Ive tried to put in my office things that I love like my family or things that inspire me. Its like all these people who have accomplished amazing things and if even just a little bit can rub off on me, thats a good thing. A bankers box holds historic documents he has acquired, including a note written by Abraham Lincoln granting the bearer passage south through the Union lines. Also in the box is a letter that Branch Rickey, the baseball exec known for breaking the color barrier in the sport by signing Jackie Robinson, wrote welcoming Roberto Clemente to the Pittsburgh Pirates organization. Rickey writes, . . . it would not surprise me if you were able to play a regular position in our outfield this year. He goes on to point out a few areas Clemente needs to work on in the years ahead. Clemente, of course, must have taken the advice to heart, racking up 3,000 hits and a .317 career batting average during his 18-year career in the Major Leagues. The letter appeals to Miller because he likes the idea that no matter how good you might be, theres room for improvement. Theres another letter, from Detroit Tigers owner Frank Navin to the American League president, B. B. Johnson, in the wake of the 1919 Black Sox Scandal. Navin has been informed that if the eight players involved in the scandal testify, they may implicate some Detroit players. I assured him, wrote Navin to Johnson, that I was with you in your attempt to convict the players regardless of what might be brought to light regarding our players. Miller likes that letter, he says, because it represents the ideal that you should do the right thing, even if it carries risk. He admits he has a fascination with the Black Sox Scandal. I find it interesting I think because it deals with fair play and integrity, says Miller. Its interesting that even though they were acquitted, they were still banned from baseball. A game bat used by Shoeless Joe Jackson, the centerfielder implicated in throwing the 1919 World Series, is one of Millers most valued items. 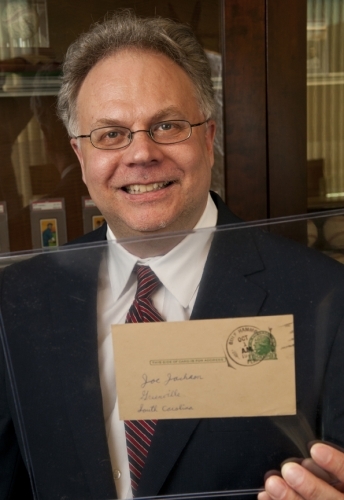 The attorney even has a postcard he acquired from Jacksons estate written by a young fan. I have read your story in the latest issue of Sport and I believe every word you said. I dont believe anyone who did as well as you in the Series would throw it. I dont care if Landis was boss of baseball, Id a punched em in the nose. I believe in second chances, says Miller, after reading the postcard. And then there are the baseball cards. Hundreds of them. Many of them rare. 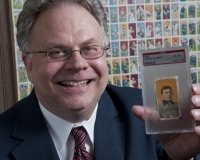 In fact, he is missing only one card of New York Highlands pitcher Judd Doyle to complete his 524-piece set of T206 cards, painted portraits of players issued from 1909-11 and packaged with cigarettes. It is the set that includes the most famous baseball card in existence: one of immortal Pittsburgh Pirates shortstop and original Hall of Fame inductee Honus Wagner. Only 50 to 60 samples of the Wagner card are believed to exist. Miller keeps that one, and some of the other more valuable ones, off site in a safety deposit box. I didnt plan to have a museum quality collection, says Miller, who actually plans one day to donate or loan his collection to a museum. It just sort of evolved. A huge baseball fan, Miller started collecting baseball cards as a kid, but in the mid-1980s, with a little more resources at his disposal, he took up the pursuit with a vengeance. He now owns a mint condition Walter Johnson rookie card; four versions of the Ty Cobb card; autographed 1955 Topps cards of Hank Aaron, Willie Mays, Jackie Robinson, Al Kaline, and Roberto Clemente. He has what he believes is the only Mint 9 card of Frank Chance (of Tinkers to Evers to Chance fame) in the world. Miller, who grew up in Detroit and was inspired to enter law by his father, who is 83 and still practicing, graduated from Georgetown University in 1983 and earned his law degree from Wayne State University Law School in 1986. He worked at Honigman Miller until he opened his own firm in 1994. In the last few years, Miller says his firm has obtained in excess of $500 million in settlements, including a $20-million settlement in a securities lawsuit. The success of his firm allows Miller to pursue his interest in building his collection as the spirit moves him. I pick them from my heart, says Miller of his eclectic collection. It has to hit me in a certain way. The way, for example, the Washington letter resonates with him as a lawyer. If a case is going south, you work harder. You raise the regiments, says Miller of how the letter inspires him. Ive always believed there are opportunities in the face of disaster. He quotes the letter from memory, You must feel the necessity of the measure.